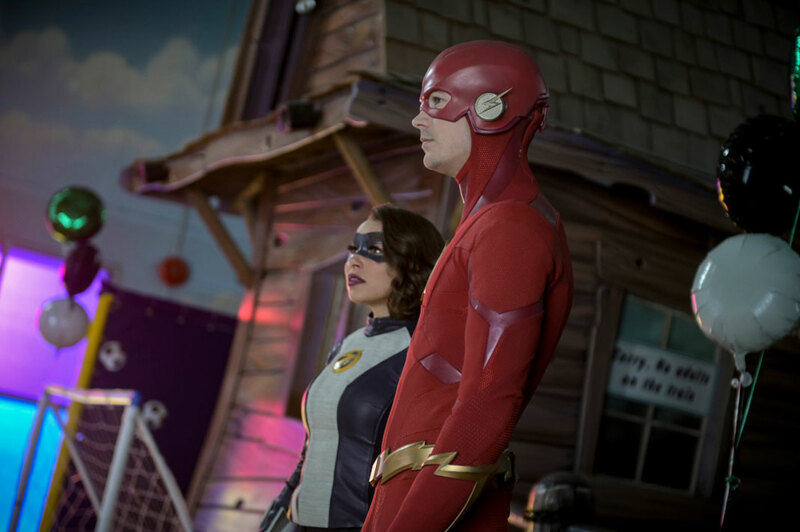 One way or another, everyone in this week’s The Flash Episode 5.17, entitled “Time Bomb,” is dealing in secrets and playing with the truth. 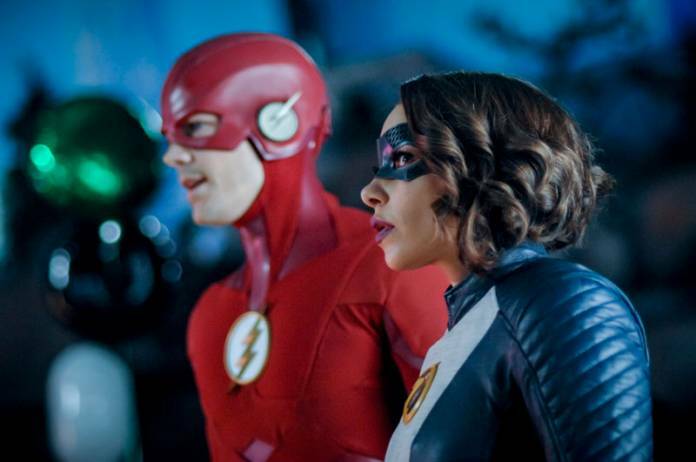 The episode opens with Eobard Thawne telling Nora that he does not know how to deal with this new Cicada that showed up in last week’s episode, and that the only thing left to do is to tell Barry the truth about their relationship. Thawne once again calls Nora “Little Runner” and I still find that unnerving. It indicates an ominous level of intimacy between Thawne and Nora that reminds me of Thawne’s relationships with the team back in Season 1. He must have been working with Nora for a long time to be on those terms with her. Nora is visibly shaken at the prospect of revealing her big lie to the team. Grace/Cicada (Sarah Carter) is at the cabin with Orlin. Orlin learns that this new Cicada is his niece Grace from the future – just like the Flash’s daughter – and he is also visibly shaken. Grace tells Orlin she remembers everything that he taught her, and wants him to get his powers back. But first, she has some unfinished business to tackle. 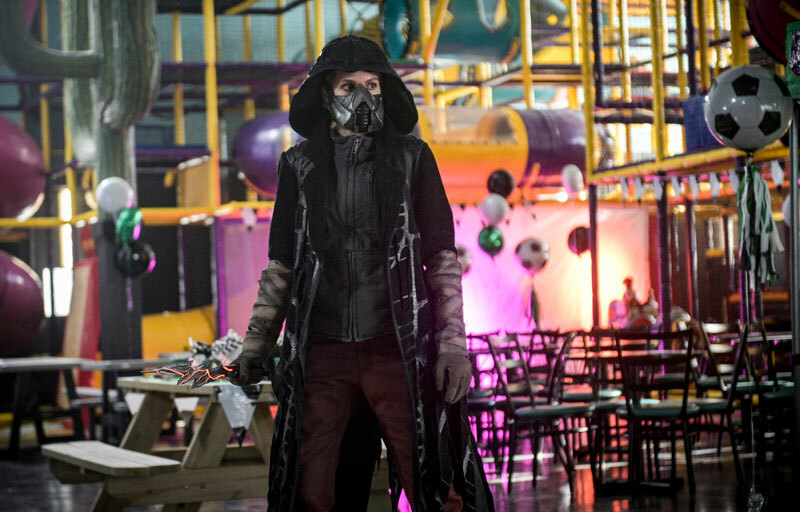 Sherloque (Tom Cavanagh) is busy trying to uncover Nora’s secret. He is still working on trying to translate her journal and knows she’s been working with someone. It’s great to see his dogged pursuit of the truth and like his namesake, he knows he is close to uncovering the thing that Nora is trying to hide. Ralph is back and up to speed about this new Cicada when Cisco gets an alert saying that there has been a break-in at their Starchives – huh? Flash fans, myself included, may have been under the impression that old tech was stored in S.T.A.R. Labs, but there is an off-site secret archive where everything is kept. I like the name, but it felt like a convenient plot device for the purpose of moving this episode further. We shall see if this Starchive comes up again in future episodes. It turns out nothing was really taken or it was, in the future, because there are now two of Thawne’s time spheres (another throw-back to Season 1)– one from the current timeline and one from the future. (Cisco invokes Operation Shazam! to determine that it is the same time sphere. Iris scratches a lightning bolt on the sphere in the Starchive and it shows up on the sphere outside. It’s a nice little plug for the upcoming DC movie!) This is how they realize that whoever kidnapped Dwyer is the Cicada from the future. In the meantime, Grace goes to CCPD to steal a cold case file. The file was from an incident in 2017 when an ATM exploded. Cisco goes back with Barry and Nora to the bank and Cisco vibes that Grace’s parents were killed in that explosion. They realize the new Cicada is Grace and she is going after the meta who caused the explosion. That meta turns out to be a mom named Vickie Bolen (Catherine Lough Haggquist) who is keeping her meta powers a secret from her family. Barry, Nora, and Joe meet up with her at her daughter’s soccer party. She did not know she killed anyone in the explosion – it was an accident. But she does not want to tell her family she is a meta and go into protective services. Unfortunately, Cicada shows up and all hell breaks loose. It is only when Vickie throws an exploding soccer ball at Cicada that they are able to escape, but Vickie’s daughter gets hurt in the process. Back at the cabin, Grace argues with Orlin about Vickie. Orlin read the police report that Grace stole and said that her parents’ deaths look like an accident. They were not killed during a robbery. Grace disagrees and lays out her plan to avenge their deaths and continue their mission of ridding the world of all metahumans. Sherloque is obsessed with learning about the sphere and Thawne’s connection to Cicada. He first looks at the schematics for the time sphere and reads Thawne’s writing that says ‘The timeline is malleable.’ So, there is the connection between Nora and Thawne! Sherloque then goes to the Starchive to dig around Thawne’s stored items. This scene is a joy for Tom Cavanagh fans everywhere. Sherloque sits in the Harrison Wells wheelchair and puts on his glasses and voila! – it was as if Sherloque was Wells/Thawne of Season 1. I admit I got a little giddy; the visual was perfect. Sherloque continues to inspect the chair and pushes a button that pops open a secret compartment with a mysterious flash drive. Sherloque brings the drive to Gideon and it shows Thawne writing on the whiteboard using the same symbols that appear in Nora’s journal. Sherloque asks Gideon to compare the writing to the journal and it’s a match. Thawne was the one who wrote those symbols in the journal. Things are not going well at the hospital where Vickie’s daughter is being treated. Vickie’s husband and daughter are not dealing well with the discovery that Mom is a meta. Nora does not understand why they are so upset. This is Barry’s chance to explain to Nora that keeping secrets keeps people apart and that you can’t really know a person who keeps secrets. Secrets are also dangerous, even if the reason for keeping the secret is to protect the people you love. Cecile, who is also in the hospital, senses overwhelming hatred coming from young Grace. When Nora was in Grace’s mind, she learned that Grace could hear everything Orlin said to her. Unknowingly, Orlin taught her to hate metas and this is where her hatred was nurtured and grew. If only Orlin could have kept the meta-killer side of him a secret from Grace, she might not have turned into the hate-filled killer that she is. This is one instance where a secret could have done some good. Nora also senses Grace’s return. A dagger is thrown, just missing Vickie and her daughter. XS speeds the daughter away, and Barry jumps into his Flash suit (I love seeing that special effect) and grabs Vickie. But Grace has Vickie’s husband, threatening to kill him if Flash doesn’t surrender Vickie. Flash ends up fighting Grace and losing badly. Grace is about to kill him but Orlin shows up to convince Grace to stop, insisting that he was wrong and that she does not have to be this killer that she has turned into. Grace disagrees and throws her dagger, killing Orlin instead, and then flies off. A dying Orlin begs The Flash to save his niece. Elsewhere in the episode, we’ve had the side story of Cisco and Kamilla. They are now officially in a relationship on social media, and Cisco looks happy. The only problem is, as we learn through Ralph’s meddling, Cisco has not told Kamilla about his meta powers or Team Flash. This secret is partly to protect her, and partly to help Cisco feel ‘normal.’ He really does not want to admit to the craziness and danger of his meta life and unfortunately, despite Ralph’s warnings about leading a complete life, I fear that will not change. The story line is leading, I think, to Cisco taking the meta cure. I guess we shall learn more as the season finishes up. And that leaves the one big secret to be revealed. When the team gets back to S.T.A.R. Labs, Cecile senses that Nora has something to tell them. Nora is still hesitating, so Sherloque chimes in, revealing the Nora/Thawne connection that he’s been working on figuring out since he met her. Nora was tearfully begging Sherloque not to tell – and it was devastating. The look on Barry’s face and the tears in his eyes when he heard that Nora has been working with Reverse Flash all along was heartbreaking. That heartbreak turned quickly to anger as we see Barry speed off, depositing Nora in the ultimate time out – she is locked in a cell in the pipeline. She tries to tell Barry she is sorry for lying to him but he just walks away. The scene is so sad and over all too quick. 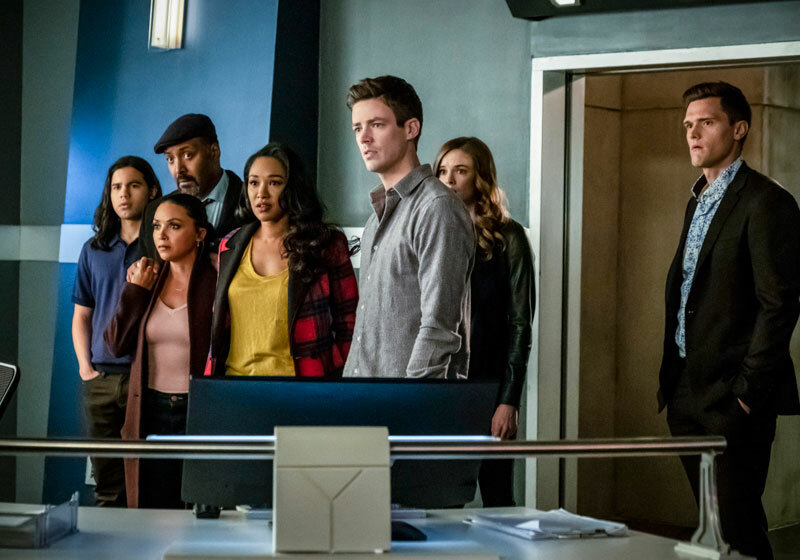 We will have to wait until April 16 to find out more of how Barry and Iris deal with this betrayal. I can’t wait. Watch the preview below! Tell us what you thought of “Time Bomb” in the comments below.